This decision involves parallel appeals from (1) a district court siding with the accused infringer on noninfringement grounds; and (2) a PTAB IPR decision siding with the patentee confirming patentability. On appeal, the accused infringer won on several grounds, but it appears that at least some of the claims will be found both infringed and valid. In this post, I focus on the PTAB decision and self-harming prior art. 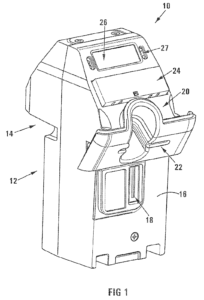 The two patents in suit are related to single-space, credit-card enabled, solar-powered parking meters. U.S. Patents 8,595,054 and 7,854,310. Of the two, the ‘054 patent has the earlier effective filing date (December 2006) while the ‘310 patent’s associated application was not filed until 14 months later (February 2008). The two patents are both owned by IPS and have one overlapping inventor (King). However the patents also have several non-overlapping inventors. Relevant for this case, Schwarz is a listed inventor of the ‘054 patent but not the ‘310 patent. Once the ‘054 patent published in 2009, it became prior art under pre-AIA 35 U.S.C. 102(e) with a prior art date of December 2006. 102(e) offers two additional tricks for our situation here: First, a published application or patent only counts as prior art if filed “by another”; and second, 102(e) prior art cannot be used for obviousness purposes if the purported prior art is owned by the same entity as the application/patent being challenged. If Schwarz is a joint inventor of the anticipating disclosure, then it is “by another” for the purposes of § 102(e). . . . Because the [later] ’310 patent claims clearly include elements previously disclosed in Figure 8 [of the prior ‘054 patent], the question is whether Schwarz conceived those elements as they were disclosed in the ’054 patent. . . .
of the full invention, was significant. Okay, based upon the Federal Circuit’s conclusion that Schwarz is an inventor of that disclosure in the ‘054 patent and not listed on the ‘310 patent, his contribution is “by another” and thus can count as 102(e) prior art. Same Owner: The same-owner caveat on 102(e) is quite powerful. However, pre-AIA it only applied to limit the obviousness doctrine. Here, the challenge is anticipation and so the reference counts as prior art. The result here is that the earlier application counts as prior art — as such, Federal Circuit reversed the PTAB decision and remanded for a finding that the claims should be cancelled. Note here that these details have been substantially changed by the America Invents Act. Under the new law, the same-company exception applies for both obviousness and anticipation. Thus, this case would have a different outcome. In addition, the “by another” language was removed and replaced with “names another inventor.” I don’t believe that this second language actually changes the law. The result here is that the ‘310 patent is invalid, but the ‘054 patent remains strong and at least some of its claims appear infringed. I’m not sure I understand – is this saying that a company can never have it’s patent invalidated due to its own prior art? Not for ownership prior to other concerns kicking in (for example, publication — which provides a strategic impact of defaulting to always filing with a non-publication request). 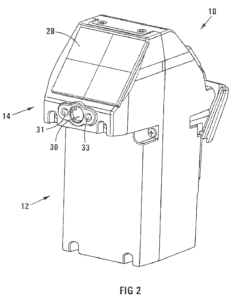 (2) the claimed invention was described in a patent issued under section 151, or in an application for patent published or deemed published under section 122(b), in which the patent or application, as the case may be, names another inventor and was effectively filed before the effective filing date of the claimed invention. (B) the subject matter disclosed had, before such disclosure, been publicly disclosed by the inventor or a joint inventor or another who obtained the subject matter disclosed directly or indirectly from the inventor or a joint inventor. Also to be considered is the non-statutory double patenting (which roughly corresponds to the granted claims, but not the disclosure, of a patent previously filed by the same applicant being used in obviousness analysis). The thicket here is far thicker than a first glance may indicate. The owner here (IPS Group) holds 21 granted utility patents and 40 granted design patents – as revealed by a separate search of the USPTO database. I did not run a publication search, as often there is overlap with the granted items, and some of the still active items may well be filed under a non-publication request. five still pending (with the last pending filed as recently as August of 2018. When faced with prior art D1 of “another”, can one get in under the “same entity” exception, and dissolve the objection to patentability by moving, in response to that objection, to acquire ownership of D1? In other words, what is the effective date for assessing “same entity”: filing date of D1, date the objection to patentability on the basis of D1, or some later date? …but effectively [pun intended], the answer is no, one cannot remedy a first charge by only later (after the critical date related to the filing) going out and bringing the “offending” item into the ownership umbrella. Max – First, the “another” language is from an older version of the statute. The relevant portion of the current version of 35 USC 102 is presented above at 7.2. The bolded portion at the bottom of that post provides the answer to your question under the current law. No. They have to be co-owed at the time of at the effective filing date (e.g., taking into account priority filings). The previous version of the law referred instead to the time of invention. Literally MM’s muh demokkkrates lol. Pretty balsy to put that in his yearbook. I don’t get the relevance here. Was he a patent attorney at some time? It’s self harm lol. Also, it’s relevant to MM’s constant “muh republikkkans” jeers. He’s now btfo. MOST ALL of Malcolm’s rants and “feelings” posts are examples of self harm. As I noted recently in reply to Night Writer’s suggestion that Malcolm is paid to advance his propaganda, if that were indeed so, then the person(s) paying him should demand their money back. Malcom’s “swagger” (as the late Ned Heller described it) is one of the worst forms of advocacy that I have ever seen. He does a (nigh constant) DIS-service to the positions he would want to see advanced. I’m not so sure about this, this is a first to file kind of issue, isn’t it? Take this fact pattern – regardless of whether King invented a given element or feature, Schwarz was clearly aware of that feature, and this document is proof of that as much as if it was a whole new reference with only Schwarz’s name on it. The question of whether Schwarz derived from King is relevant in a first-to-invent system but not a first-to-file one. This is unlike the previous public use issue, in this case the language change to “names another inventor” directly conflicts with the prior court action of interrogating who actually created the particular feature. The plain meaning of the statute controls, and I’m not sure if it’s proper to go delving into who invented the feature when the statute only asks if the filing names another inventor in a first to file system. That’s my reaction as well. Imagine I file SN ’77, in which I claim X but also disclose X any Y. I name two inventors, A and B, as inventors of X. Then I divide out SN ’88. My Div claims Y. When filing the divisional, I name as inventors only A and C. Why, because B made no contribution to Y. Now suppose that instead of SN ’77 I had filed on the same date SN ’99 with claims to both X any Y and naming all three inventors A, B and C. SN ’99 then gets used as the 102(e) attack on a later filing with inventors A and B alone. Questions: 1. Would ’77 or ’88 have been just as effective as attacks? 2. Do you still see no merit in the stance taken by the Federal Circuit? Um, no. Not in your hypo here, as the later does not have a “new” previously unnamed inventor, and the “attack” simply would not be made on inventor identity. There is simply no reason to start down a path questioning the later filing based on inventors. That’s the trouble with hypo’s. They fail to reveal the point. Here, I was envisaging a 102(e) attack on an application to protect invention Y, which application names as inventors only A and C.
An earlier-filed application for Y-overlapping subject matter is SN ’88, and SN ’88 also names only A and C.
Another possible earlier filing is SN ’99 but that filing also discloses both of inventions X’ any Y’ and names all of A, B and C as inventors (because B contributed to the invention of X’). What I wondered is whether SN ’99 is a good 102(e) attack on the Y claim, while the 102(e) attack using SN ’77 doesn’t fly. (And the answer remains the same. The earlier item with all the inventors will NOT be used to attack the later item (the later item being attacked with less, but no different inventors). Your added verbiage does not make your hypo any less cr ppy. In my hypo, all I do is to abbreviate Schwarz to “B”. “B is a listed inventor of the ‘054 patent but not of the ‘310 patent”. If what I wrote is “cr appy”, then so is what Dennis wrote. This may be the exception that proves the rule. You’re not alone. And this seems like the kind of requirement they would ignore, doesn’t it? Presumably those dimensions are recited in the claims, right? They must be. Those dimensions may have dictated the placing of different parts in different places etc. in a fashion that was “design interconnected” to the rest of the disclosure as a whole. That’s what I’m thinking it is more likely the court was finding.